The final decision still awaits in the Paris Climate change outcome. The now revised shorter text of the agreement is being negotiated on Friday and Saturday and perhaps beyond. Still we see mutual recriminations both at home and globally from all sides. Having started down the road for agreement it seems that most key powers recognize the problem and are working to put together a final document that will hopefully move us all forward towards a cleaner safer and livable world. But problems abound. The initial release of the draft COP21 climate agreement text was criticized by environmental groups as not going far enough, especially on the side of shutting down carbon based energy sources by 2050 and not providing enough funding to do all that needs to be done. A new shorter draft text has been issued which many think still leaves key issues unresolved. There has appeared to be many objections by a wide range of nations to the draft text. India and Malaysia want a stronger text including more resources from the richer nations. Advanced richer nations want the text to apply to everyone as the best way to deal with the climate crisis. As we have noted, the stumbling blocks towards the last days of the conference are appearing. China especially, has a wide range of objections to the existing text including not wanting to accept a “review every five years of the pledges of action to reduce carbon emissions and to reassess the target of no more than a 2 degrees Celsius increase in temperatures.” The Chinese representative said Beijing would not be able to change its climate plans for at least another 25 years. Many other countries have agreed, including developed and developing to reviewing the targets. The Chinese representative was against trying to look at a possible goal of a rise of just 1.5C and said it was not something that is realistic. China opposed the measure in the agreement to broaden the base of nations delivering money to help poorer countries fight climate change. The 1.5C was also opposed by Saudi Arabia in another spanner in the negotiations. On the other side Island nations and others said without the 1.5C limit they will cease to exist. This hoped for goal is supported by a wide groups of developing nations and Europeans to deal with the climate crisis. The real problem is that even with the pledges on the table now it will be hard to meet the goal of keeping temperatures well below even the 2 degree C target. The bottom line seems that more, much more will be needed now or in the near future if the science is right on emissions and means to limit them. This new test was issued after intense overnight negotiations Wednesday, and the Conference is going into at least Saturday or Sunday. It would be a wonder if even that extension would be met unless major compromises were found. Island nations were especially asking for yet stronger language. The reality is likely that any agreement will likely have some changes but not meet fully what any side desires. The question is does the “imperfect” defeat any agreement that will move towards the needed solutions? On the other side, the climate deniers, coal, oil and other polluters and Republican supporters of the deniers and industry, already say it goes too far. Environmental groups in Paris believe it is too weak and they have a real case to be made, but these global negotiations are places of hard realities and the real question is are we truly moving forward? No document of this comprehensive and negotiated type, with 195 participant countries, will ever please all sides. This new draft of 29 pages is down from 49, in which the key top members from the main nations will argue and work out a new, hopefully consensus, draft in the next few days, (or not), that will again not satisfy everyone likely. There are, according to reports, some 100 items where decisions have not been made due to conflicts over objectives or methods. Officials say the key issue is still how to define the obligations of nations developed or developing in addressing climate change. The conference will in the future either be seen as a major negative catastrophic event for the globe or the starting point for some real progress. It is this text and the commitments that will follow that will prove if the international community – all sides – are in this together and all share a responsibility or we abandon our earth and the avoiding of mass disasters that we can in fact mitigate. An assessment of the results and future paths and options will be posted after the results are known! Click on the title of this post where you can leave a comment! 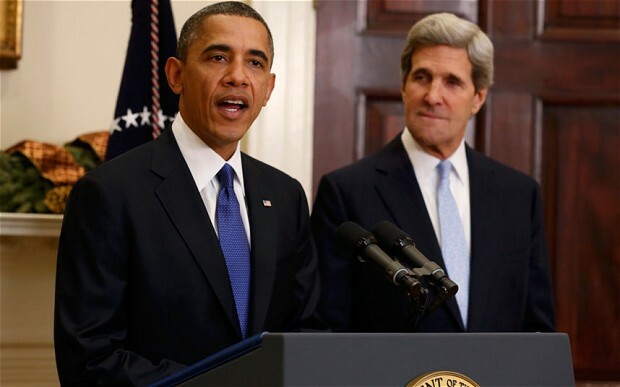 President Obama and Secretary of State John Kerry face both criticism and support as the framework for the Iranian Nuclear Deal falls into place. In many ways this “framework” agreement achieves the key necessary elements for assurance against any Iranian unknown nuclear “breakout.” It provides the basis for future initiatives that might, with great focus and a large amount of wisdom and patience by all sides, move some of the destructive dynamics in the region towards some measure of reconciliation and what we used to call ‘detente.” Yet, from the cries from its critics at home, the hysterical opposition of Netanyahu and his right-wing supporters, and some in the Sunni Gulf States, there is still a lot of hefty lifting to do to sell this effort by President Obama and Secretary John Kerry at home and abroad. The road towards the final text and agreement may still produce some bumps, but the key signal is that both sides want and need an agreement that puts to rest the dangers of both the Iranian weapons program and the likely dangers of a non-agreement for a long period. This agreement also can set the stage, with some luck, for other measures of dialogue and possible understandings that might serve American interests in achieving a more general security landscape for all nations in the region. While right now this seems a very difficult task given the convulsions now seen, for that very reason it is one that needs to be undertaken and likely may take years or even a decade to come fully to fruition. The domestic opposition comes from the same expected right-wing neo-cons and Republicans hawks that seem to think that anything short of bloody war is unacceptable. Would they put American troops on the ground in Iran? Would they have us bomb Iran to smithereens for Israel’s own misguided right wing war-hawks or to help facilitate a mad joint attack? They have not said about “then what” because there is no good answer or outcome of that option. They talk in vague generalities and provide no clear security and mutual accommodation path towards stable peace in the Middle East, but indeed seem to want added conflict and chaos. President Obama already has indicated he will “consult” with Congress. But sadly, it is likely that the diehards on the right of the GOP and even some Democrats will be seen as skeptical to appease their paymasters and crazies in deadly opposition to Obama no matter what is in the agreement. The key now is to stop any effort to pass a new sanctions bill on Iran or one that would require Congressional agreement to the final accord. There is a long history of such international agreements by both Republican and Democrat presidents. If this had been Ronald Reagan, the Republicans would be praising the hell out of this accord. Obama holds hopefully the high card here as, in the end, he can veto any bill that tries to destroy this agreement. Obama will need to work hard to get enough support in Congress to prevent the dismantling of the agreement. It will be a very hard hill to climb to get them to agree to revoking sanctions. However, there are other avenues to this end via Presidential actions, our cooperative allies, and the UN Security Council. The problem with getting understanding, let alone agreement with Prime Minister Netanyahu is that the whole justification of his regime is to maintain a constant state of aggression and antipathy against the Palestinians and Iran. While there is some understanding for this given the past, it is a counterproductive stance if one wants long-term peace and security for all in the region. It is doubtful that Bibi will relent and may likely employ his minions in the U.S. to fight this accord no matter the circumstances. Yet, many supporters of Israel know that an agreement that ensures a de-nuclearized Iran for a long period of time, the full engagement of the U.S. in the region, and the creation of a true peace deal, is in the real interests of Israel and the required two-state agreement. The former security officials of Israel know that it is unfortunate that Bibi only cares about his own political future, rather than his people and keeping Israel’s state security free from continued threats and the escalation of military capabilities. While some kind of reconciliation with the U.S. would be hoped for, it is for Bibi to make the first move given his continued intransigency and duplicitous behavior. Yet, in some way the administration needs badly to make clear to Israel’s citizens that this agreement is in their interest, that we care about and support their security, and want and will still seek a peaceful region. For that, we are already rethinking our stance in the region and paths towards some kind of firm of peace settlement. The other task is to get the support of the American people and our allies as to the benefits of this agreement. Most of the public has little knowledge of the issues, the trade-offs, and the importance of this agreement. This needs to change. Administration leaders need to get on the airwaves to argue for this accord. Obama can expect widespread conservative and right-wing media opposition from the likes of Fox News, the Wall Street Journal, the Washington Post and the talking nuts on radio. This will be hard to overcome unless the administration, experts in the area, and Democratic politicians do a full court press on the merits of this accord with the media. On their side is the polls show most Americans do not want to make war with Iran. On the issue of dealing with the largely Sunni Gulf States and in particular Saudi Arabia, the president has invited the leaders of these states this Spring to Camp David. Already Saudi King Salman has taken a less confrontational position and has said to Obama that he hoped it would strengthen “stability and security in the region.” The discussion will include not only the new agreement, but likely an attempt to get some measure of wide cooperation on a strategy that will also address other security concerns in the region, as well as to see if a path is possible for some measure of cooperation and meeting of the minds between Sunni and Shia nations. This is but only one step towards a more stable region, but it is one of the key building blocks in a very complex region filled with conflict and mutual animosity that needs to be addressed. In the end, we and our allies will need to talk to both leaders of Sunni and Shia nations as there are already signs of common interest in putting down ISIS’s universal butchery towards both Sunni and Shia as well as other minorities and in bringing stability and economic prosperity to the entire region. This is a job for more than one administration and America had better be wise in its future choice of its own leaders.